For those who want to explore an aesthetic and functional enhancement to their garden we can provide advice on choice, position, design and assembly of a wide range of structures; including water features of all sorts, decorative arches, pergolas and for the man who requires personal thinking space, everything from the conventional but pleasing secured garden storage space to a fully functioning “man abode”. From small to genuinely large, basic and functional to personally liberating we have ideas for a wide range of garden enhancements. Fencing can do more than simply mark the border of your land. It can provide a decorative feature that compliments the colours within your garden and can protect from wind borne weeds and garden predators. 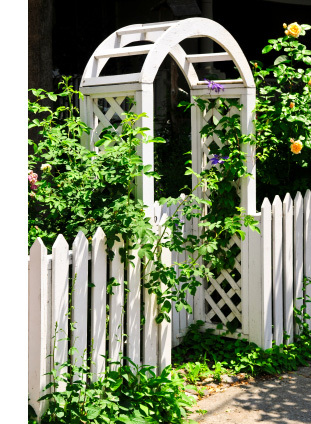 Arch can provide in-garden divisional fencing as well as detail trellises. Arch can provide, excavate and install posts gates – other supports for the most exposed or heavy weight fencing applications. Fencing can be the final piece in your garden jigsaw.